This is not the most common Chinese recipe but it is delicious none the less. 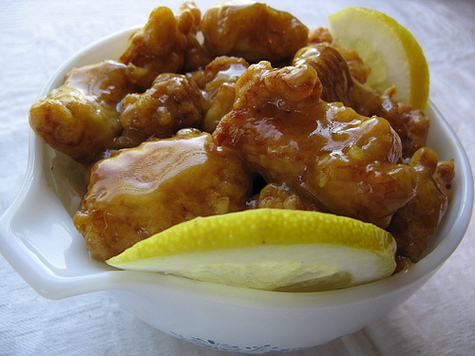 This Chinese Lemon Chicken Recipe is fairly simple to make and we have done our best to aim at amateur chefs. If your your a fan of this dish and have any variations of it then please do let us know. Now this may look like comcomplicated but trust me, when it actually comes to doing it, it's pretty straight forward. Chop up the chicken into small chunks and then put in a bowl with some soy sauce and 1/2 a teaspoon of salt. Cover with some cling film and set aside to marinade for about 30 minutes. The longer the better. Beat up two eggs in a bowl and then mix in the pepper, 1/4 of a cup of corn starch and teh baking powder. Dip the marinated bits of chicken into this mixture. Heat a pan of oil, enough to deep fry the pieces of chicken. Get te oil nice and hot and drop in the chicken. Keep this up untill all of the chicken pieces are nicely cooked. They should look lovely now. Just set them aside somewhere in a bowl. Mix a 1/3 of a cup of sugar with the chicken stock and two tablespoons of lemon juice. Add a pinch of salt and the throw in two tablespoons of cornstarch. Mix thoughly and tehn chuck in the four slices of lemon. Cook in a saucepan for about 5 minutes, the sauce should get nice and hot and start to turn clear. Take the lemon slices out and discard and add the deepfried chicken pieces. Heat untill everything is nice and hot. Serve with some nice fresh rice and some vegetables like carrots or broccoli.